I’m sure even if you are not a big fan of Star Wars, you’ll probably know that today May the 4th is known as Star Wars Day, a day that Star Wars fans celebrate all things Star Wars. The 4th of May is Star Wars Day due to the date being a pun on the famous Star Wars line…may the force be with you, with fans usually saying on this day of the year…May the fourth be with you. So what we thought we’d do today in celebration of Star Wars Day, is bring a few Star Wars mobile apps for your consideration, and we have come up with six in all, but I’m am sure there are a load more, and if you happen to have your favourite Star Wars app on whatever platform, we’d love you to share it to our comments area below. First up we have Star Wars: Lightsaber Duel, an app for the iPhone, iPod Touch and Apple iPad that allows you to imagine you are wielding the weapon every Star Wars fan wants, the Jedi lightsaber, and if you have a friend with the same app you can connect to each other via Bluetooth and have a lightsaber battle. 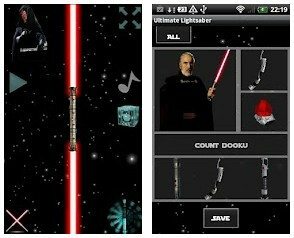 The Star Wars: Lightsaber Duel app allows the user to swing their iPhone around for authentic lightsaber sound effect, features eleven new characters, improved graphics, Force lightning, the ability to play your own music in the background, and create more than one custom character. 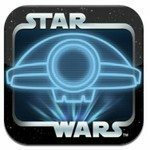 The Star Wars: Lightsaber Duel app can be downloaded to your device from iTunes at a cost of $0.99. Next up we have the Star Wars Arcade: Falcon Gunner iOS app, which is only for the iPhone 4, 3GS, and 4th gen iPod Touch, and is an augmented reality game that let’s the gamer do battle with the Empire allowing you to be the gunner on Han Solo’s Millennium Falcon. With the Star Wars Arcade: Falcon Gunner app the AR mode takes the battle to your living room by using the camera, compass, gyroscope and accelerometer, and let’s the gamer control the action by moving their body. There are over 20 levels in this first person action shooter along with Game Center and Facebook integration. 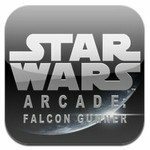 The Star Wars Arcade: Falcon Gunner app can be download from iTunes at a cost of $2.99. Last of the iOS app offering we have the Star Wars Pit Droids app, an app whereby the gamer helps Tatoonine Toydarian junk dealer Watto, corral his droids as they stroll mindlessly into danger across 95 levels in the Star Wars galaxy. The Star Wars Pit Droids iOS app brings twenty more levels to the game, with three additional achievements, a new leaderboard, four new tool-wielding droid types, and now C-3PO solutions. The Star Wars Pit Droids app can be download to your chosen device as a free app from iTunes. 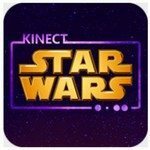 With the Kinect Star Wars Windows Phone app you can view your feeds in the style of the iconic Star Wars opening title sequence, update your status, share links, and like and comment on other’s posts. The Kinect Star Wars app can be downloaded to your Windows Phone by hitting up the Windows Phone Marketplace. Next we come to the Android platform and start off with the Ultimate Star Wars Lightsaber app, which is of course a lightsaber simulation app that let’s the user play at being a Jedi or Sith, with multiple sounds and sensitivity adjustment, and move slowly to swing your lightsaber or move fast to hit. The Ultimate Star Wars Lightsaber app for Android uses the camera flash for lightsaber fights and force, you can Force throw your lightsaber by finger movement, the ability to choose your character, hilt, background image, music, and lightsaber colour, and SD storage is possible. The Ultimate Star Wars Lightsaber app can be downloaded for free by hitting up Google Play. 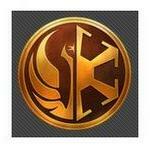 Last but not least we have The Old Republic Security Key app for Android, an app that if you have a Star Wars The Old Republic account you can protect that account with this an additional layer of protection by generating a one time passcode that you use in conjunction with your regular password. The Old Republic Security Key app enables the user to keep their account more secure from such things as hackers, trojans and other unauthorised users. For those that wish to download The Old Republic Security Key app to their Android device you can do so for free by hitting up Google Play. So there you have it, several mobile apps so you can get your Star Wars Day, May the 4th be with you action on.